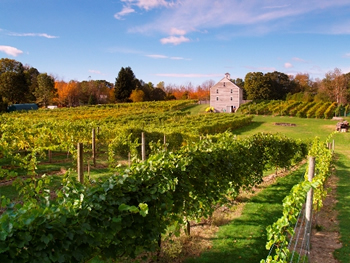 Jewell Towne Vineyards is named after the historic district of South Hampton in New Hampshire. On fertile, southward-facing slopes by the Powow River, the vineyard is located in a surprisingly favorable climate for grape growing. It is sufficiently far inland to bask in the heat of summer's valley effect, yet the New England winter cold is moderated by the proximity to the ocean, seven miles away. Our winery has a tasting room that sells our wines during open hours, 11am-5pm on weekends, and 11am-4pm on weekdays. Our wines are also available in many grocery stores and restaurants in the area.